That school yard talk set the tone for the pre-debate reappearance of an old Batman television clip that swept across the blogosphere, culminating in a showing on Keith Olberman’s Countdown MSNBC program, just before the debate began. In an uncanny mocking of the two contestants on a real stage at Hofstra University, the television Batman stands calmly at his podium as the Penguin rages against him as a “mystery man” wearing a mask, who hangs out “with criminals”. When McCain charges Obama with “associating” with “the former Weather Underground leader William Ayers, [he uses, according to the New York Times], nearly every argument at his disposal in an effort to alter the course of a contest that has increasingly gone Mr. Obama’s way”. Obama responded by listing prominent Chicago leaders, including a university president, a seminary president, and the chairman of the Chicago Tribune board, who also “associated” with Ayers as members of the same non-profit board on which Obama had served. After the Ayers exchange, Obama repeated his charge that McCain would continue George Bush’s economic policies. This led to McCain’s best line of the night, a rehearsed echo of the “Senator, John Kennedy was a friend of mine, and you are no John Kennedy” retort. After this exchange McCain appeared to grow even more angry and frustrated over what he seemed to sense what was happening to him. His “last big chance” to redeem a losing campaign was slipping away. Obama clearly “won” the debate on style and temperament, refusing, for example, to sieze an opportunity to state the obvious, that Sarah Palin, McCain’s choice of running mate, was unqualified to be president. 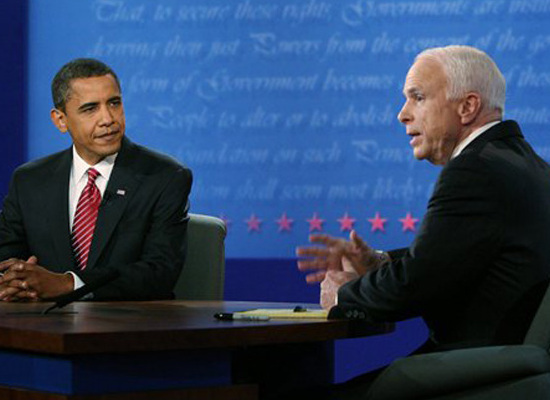 Obama met McCain’s anger with a coolness that appeared to push McCain’s to further anger. No wonder he was angry. After his years in prison and a long career in the Navy and the US senate, he was “entitled” to a place at the top far more than his opponent. You could see that, at some level, McCain felt that what was rightly his, was not to be. No wonder he feels such empathy with Hillary Clinton, whose name he evoked in the debate in a futile effort to grab female Clinton voters. That constituency could not have been pleased with McCain’s hardline anti-abortion statements. Obama was prepared to drive that point home, repeating his cautious language on abortion while McCain was left clinging to his hard line Right to Life rhetoric, which will not play well in the land of independent voters. McCain tried unsuccessfully to attack Obama’s health care and tax proposals by evoking the name of Joe Wurzelbacher, a plumber Obama had encountered during a campaign event. The name of “Joe the Plumber” was repeated 24 times in the debate in exchanges which became, frankly, too complicated to follow. McCain tried to use Joe as that metaphorical small business man who would suffer under an Obama administration. He contended that under Obama’s plan, Joe would be paying more taxes and more for health care for his employees in his plumbing company. Why? Because the creation of his new company would push Joe into the $250,000 small business income bracket, the line at which more taxes would be demanded of individuals and small businesses under Obama’s proposed tax revisions. The group of 50 uncommitted voters should have at least been receptive to McCain—Republicans and Independents outnumbered Democrats in the group by almost 4 to 1, and they started the evening with much warmer responses to McCain than to his Democratic opponent, Barack Obama. But by the time it was all over, so few of them had declared their support for McCain that there weren’t enough for Greenberg to separate them into a post-debate focus group. Meanwhile, the Obama supporters had to assemble in two different rooms to keep their discussion groups manageable. Less than three weeks remain before November 4. There will be no more debates. Several crucial swing states are already voting and polls indicate electoral college totals are mounting against McCain. The Penguin gave it his best shot, but Batman stood his ground. It is difficult to see how McCain can turn this one around. Nicely summarized, Jim. I pray you’re right – “it’s difficult to see how McCain can turn this around.” There are not many undecided left out there. I suppose the important figures come from states like Virginia, Florida, Pennsylvania, Indiana, etc.